Hi, can you embed or include a form in an e-mail? I don't hitnk I have quite understood you question. If not, we would appreciate you to give us more information about what you need to assist you better. Your answer refers to inserting a link in an e-mail. I would like to have the actual form in the e-mail, so someone can fill and submit the form without going to an external web page. But, you cannot directly add your form in the Email Body. Email Providers will not allow you to submit a form from the inbox. Hi. I think you don't understand me. 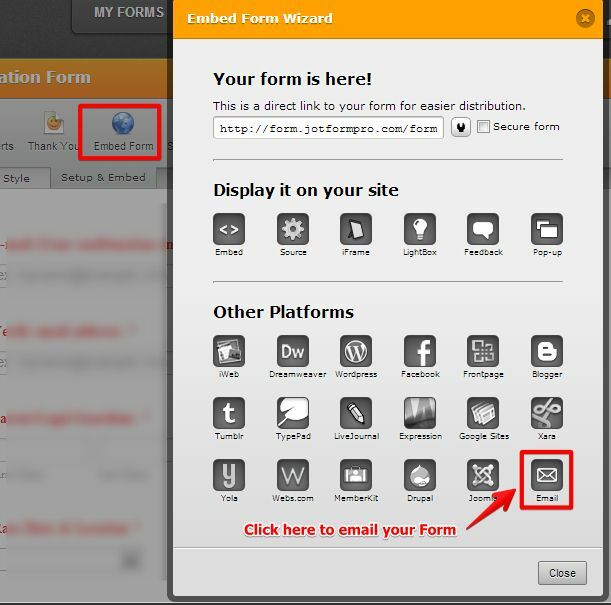 Your instructions show how to send a link of the form. The person receiving the e-mail has to click the link and then fill the form on a web page. I want to send the actual form in the e-mail, and the person receiving it would fill right in the e-mail and submit from the e-mail without ever clicking on a link or opening a web page. Hmmmm, okay. But Email Providers Will not allow you to submit a form from an inbox. 1. Preview your form in new window. 2. Press Ctrl + A (Select All), then Press Ctrl + C (Copy). 4. Your Form Will be there, right? 5. Just send it to you. 7. Now Try to Submit the Form and see whether that button is enabled, fortunately it will not, For Security Reasons. So, we can conclude that forms cannot be send as an email right? Hope Now I Understand and Explained you clearly.